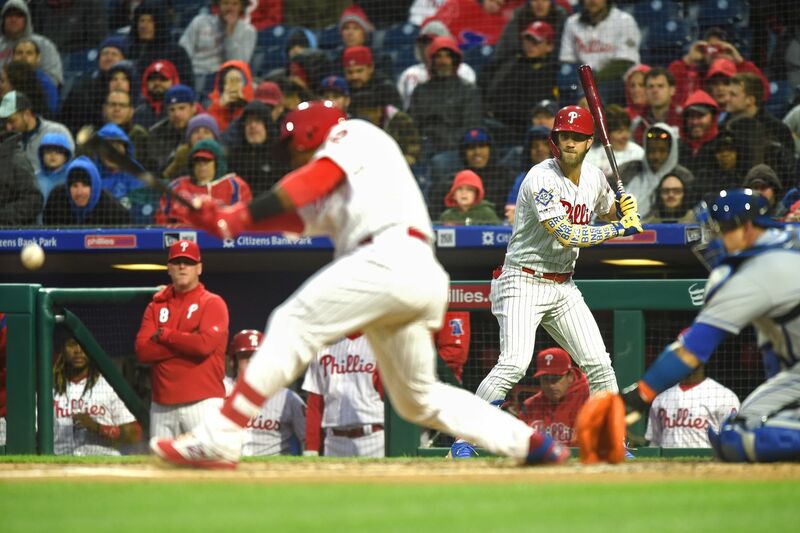 Bryce Harper (rear) watches from the on-deck circle as Jean Segua singles in the first inning of the Phillies' 7-6 loss to the Mets on Monday. The game went to 11 innings. Rhys Hoskins dropped to his knees Monday afternoon, keeping his eyes locked on the ball before grabbing it and quickly tossing it away. A few hours still remained before the first pitch of Monday night’s 7-6 loss to the Mets. It was a chance for Hoskins, who is re-learning the intricacies of first base, to receive more tuning for the fundamentals of the position. The Phillies moved Hoskins this winter from left field to first base, the position he played in college and the minor leagues. They knew his defense would not be as smooth as Carlos Santana, the man he replaced. But Hoskins’ offensive production - coupled with Andrew McCutchen’s presence in left field - could allow the Phillies to live with the loss of Santana’s glove. On Monday night, it was that glove that cost them. Hoskins, hours after running through those drills, again dropped to his knees and stared down the ball. But it was no-longer a pre-game workout and he was not locking his eyes on a tennis ball from a coach eager to help. This - a 104.2MPH smoker from Michael Conforto - was a game-deciding play. Hoskins came up short. The ball skipped off Hoskins’ glove and into shallow right field. The out would have been the third of the 11th inning and Pat Neshek would have escaped a jam after the first two batters reached base. The Mets scored the winning run when Cesar Hernandez retrieved Hoskins’ error, rushed his throw home, and bounced it into the dirt. The 11th inning spoiled another strong game for the Phillies’ bullpen. Drew Anderson, who joined the team in the afternoon from triple A, pitched two scoreless innings. Adam Morgan, who has yet to allow a run, added two more innings. Neshek was an out away from protecting the lead. Phillies Rhys Hoskins takes a while to get up after the was out sliding into second base. The inning also overshadowed another night from Aaron Nola that provided more questions than answers. Nola pitched just four innings and allowed five runs on seven hits with three walks. His average fastball velocity -- 91.9 MPH -- was nearly 2 mph slower than his last start, and the pitch lacked much movement. Nola pitched through heavy wind but he said that was no excuse. His curveball was flat and his change-up was ineffective. It was the third straight game in which Nola allowed at least four earned runs, which is the worst stretch of his career since 2016. Three years ago, that stretch was followed by a revelation that Nola had an elbow injury. The Phillies did not address their starting rotation this winter, believing they had enough in the four pitchers who followed Nola. Now, they must find a way to correct what is plaguing Nola. Nola said his body feels fine this time. Kapler said the team does not have any concerns about Nola’s health, but is instead concerned about the pitcher’s lack of command, which had been Nola’s signature-trait since college. The Phillies overcame Nola’s struggles to tie the game twice after he put them into holes. J.T. Realmuto hit a two-run single in the third and Maikel Franco hit a two-run homer in the fourth. They erased a another deficit in the eighth when Odubel Herrera scored the tying run on a bases-loaded walk by Jean Segura, who was the third-straight Phillies batter to work a two-out walk. But the rally ended with just one run. Bryce Harper swung at Robert Gsellman’s first pitch, hoping to get a pitch he could drive. He popped out. Three innings later, a loss would be sealed. Hoskins left the Phillies clubhouse Monday night and slammed his fist on the lid of a trash can. He was frustrated. The work he had done - from the early morning routine during spring training on the backfields to the drills in an empty ballpark before Monday’s game with infield coach Bobby Dickerson - was put to the test. It proved to be not enough.